Today we left my grandmother's house with very full stomachs, full of her tasty southern cooking. From there we headed west along I-20 to Kilgore Texas, near Longview. The drive was fairly uneventful. Really our first lengthy time with the cats in the car, a total of about 12 hours including short stops to stretch our legs. For those of you that are curious about traveling with cats, both of ours are very very well behaved. They sleep or look out the window, sometimes in our laps or sitting in their crates or the back seat. Both of their crates are stacked and strapped into the back seat, with a bit of string to keep the cage doors from closing on them. The litter pan is on the floor behind the passenger seat and so far no one has used it. Since Zara kept laying in the litter I covered the top with a puppy pad. I caved in before we left Charleston and bought an extra large pan so that we could use only one instead of our normal two. I have two dollar store flannel blankets that have been wonderful in their multiple uses; covering, padding, making cat nests and keeping fur off my black pants. Back to Kilgore... we arrived just in time for the basketball game of Anson's (the hubby) two youngest brothers. I felt like I was back in high school with the intense coaching and bleacher ref-ing from each parent. Sadly, despite our cheering, the guys didn't win... though I did get some fun shots (ha!) to remember the game. The guys team was in white. During December and January we visited Anson's parents twice for his sisters' weddings. Being back in their house in such a short time was an easy transition to feeling a little more at home there. 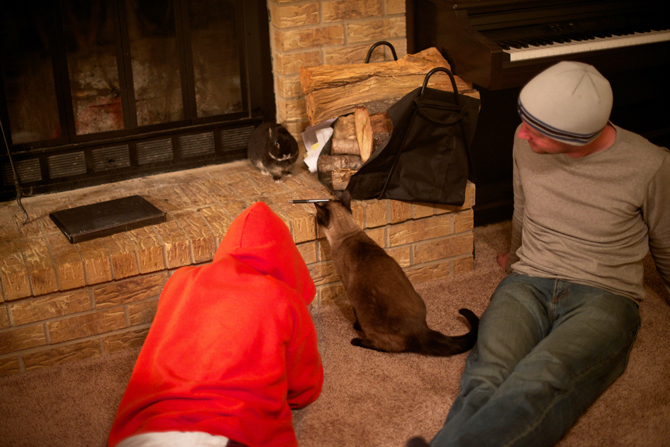 We let the cats roam around and they (kind of) made a new friend too, Trumpkin the rabbit, who is fearless. Meet Trumpkin, the cute bunny with a funny tooth in his favorite spot by the fire. First encounters. Zara didn't know quite what to make of a bunny up close.